VANKLEEK HILL, ON – Halcyon Barrel House – the off-shoot of Beau’s All Natural Brewing dedicated to mixed fermentation and barrel-aged beers – has announced the release of a new limited collaborative beer, as well as the names and styles of its next two releases. The 2017 edition is hopped liberally with Wai-iti and Azacca. Mixed fermentation of Saccharomyces and multiple Brett strains in red wine barrels define the character of the beer. Bottle conditioned, of course. It pours quite hazy, with ample fluffy foam. The aroma is all hops: orchard fruit, citrus, and all things tropical. No subtle undertones here, just hops. Flavour is equally hop-forward, with the orchard fruit leading the way, in a delightfully light body for a rather big beer. A pleasant alcohol warmth lingers, and the finish is dry, with mild bitterness. 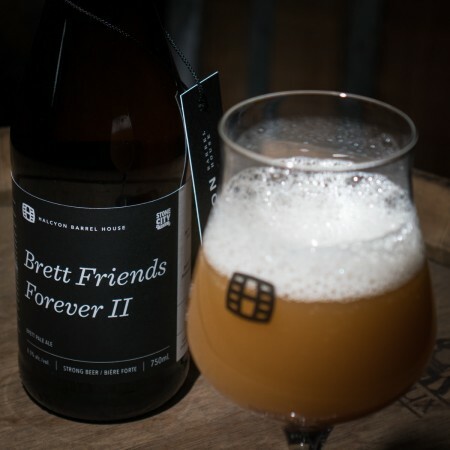 Brett Friends Forever II was released on Friday September 1st, and is available exclusively at the Beau’s retail store while supplies last. Next up from Halcyon will be Life Advice, a 3.5% abv table beer, and Gravity Well, a 9% abv sour ale. Release dates and more details for both beers are still to be announced.